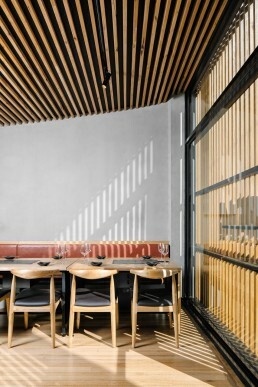 [Extract] Located in a dowdy, nondescript retail strip in deepest western Melbourne, the delicate battened façade of Hinoak, a Korean gogi-gui or barbecue restaurant, is delightfully at odds with its stodgy neighbours and the first indication of how in the right hands, even a relatively narrow space can be made to feel light and spacious. Thanks for this lie with Biasol, the Melbourne-based studio responsible for the design of London’s Grind cafés, who took what could have been a cramped, dark space and by working with a restricted palette and replacing the street-facing wall with glass, have created a bright, welcoming restaurant, that puts the focus on the food. This is prepared, traditional gogi-gui style on built-in individual grills, transferring the drama of cooking from kitchen to table-top.